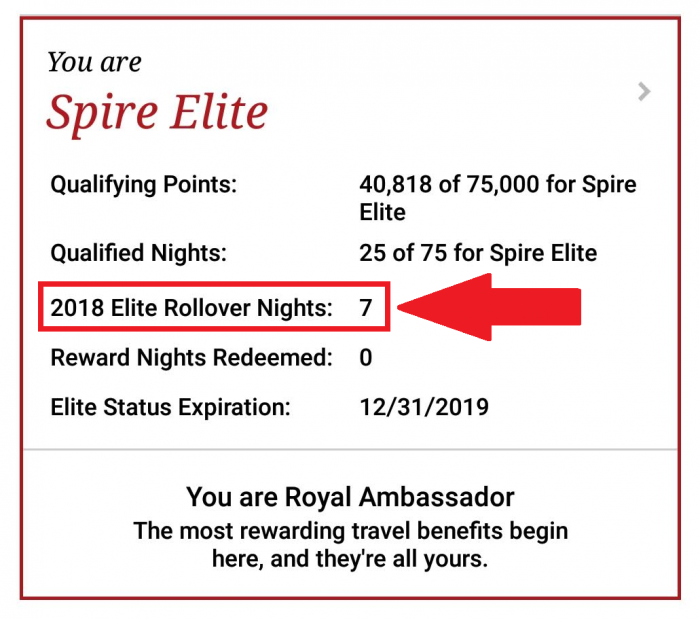 Platinum member nights in excess of 40 and Spire Elites excess of 75 will rollover to the following year after which they expire (won’t roll over from year to year). You can access IHG page for rollover program here. All Elite Qualifying Nights accrued toward Platinum Elite status in excess of 40 nights will be applied to a member’s account towards the following calendar year. Elite Rollover Nights are only valid for the next calendar year. All Elite Qualifying Nights accrued toward Spire Elite status in excess of 75 nights will be applied to a member’s account towards the following calendar year. Elite Rollover Nights are only valid for the next calendar year. For instance, every night you stay beyond 40 for Platinum Elite and 75 for Spire Elite counts towards Elite status the following calendar year. So, I consumed 82 nights last year with IHG excluding the 30 nights that rolled over from 2017. Therefore 7 nights were added to my night count this year. These really don’t matter because you can qualify for the Spire Elite based on the qualifying points of 75,000 ($7,500 in spend) and I have already passed $4K this month. Previous articleMarriott Rewards Birthday Bonus Continues In 2019!